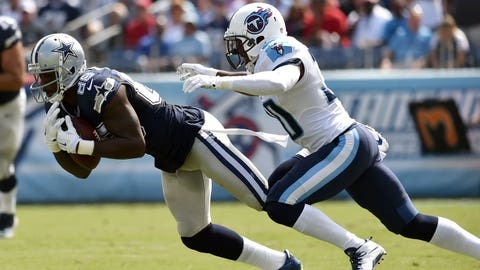 Dallas Cowboys wide receiver Dez Bryant makes a reception against Tennessee Titans cornerback Jason McCourty. Dez Bryant’s X is quickly becoming one of the most popular touchdown celebrations in the NFL. After every score, the Dallas Cowboys’ star receiver looks at the crowd, pauses and makes an X by crossing his arms. "The X is for all of the defenses," Bryant said recently during an interview with NFL Network’s Michael Silver. "I’m the guy to watch." Silver followed up by asking Bryant what he’s X-ing out? "All of the bad, all of the negativity that ever came â that approached me," Bryant said. "People don’t understand me; they paint their own pictures of me. I look at them as they’re just negative, they want to bring me down â I’ll show them. The biggest joy I can ever get is me proving a doubter wrong. I love it. I love it." Bryant believes he’s already proved a lot of people wrong. Growing up around family members who did drugs and a mother he had to visit in jail, Bryant understands the odds were stacked against him. "We knew even when we drafted Dez that there may be some weaknesses, but there was no wickedness," former Cowboys star receiver Michael Irvin said recently on the NFL Network. "He is a good kid, he has a good heart and Dez wears it on his sleeve." One of Irvin’s co-workers at the NFL Network, Hall of Fame defensive tackle Warren Sapp, has become a fan of how Bryant "plays the game with a purpose." "I love how he ferociously goes after the ball," Sapp said. "It doesn’t matter, when he catches it he is getting ready to run. He is running like a running back trying to get a third-and-1. He plays the game like it is supposed to be played, like it is your last chance to ever touch a football." While that type of aggressive style has been there since Bryant was drafted by the Cowboys in 2010, his play wasn’t always consistent. He’d have big numbers early in games and then disappear in the fourth quarter. Coming off his first Pro Bowl appearance, Bryant continues to establish himself as one of the league’s best wide receivers. But he’s far from satisfied. He’s striving for that consistency. "All the young Dez knew was, ‘Hey, just get through it the best way that you possibly can.’ Really never was told to do much â just go," Bryant said. "Every day after practice coach [Jason] Garrett writes on this piece of paper. I don’t know what he writes on the paper but it’s consistent, and it kind of struck me. "It was hard for me and all I knew was somehow, someway I have to learn how to be consistent. It was hard. Very, very, very hard."